75 days. Capsicum annuum. Open Pollinated. 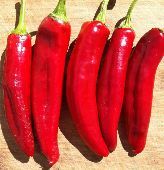 Plant produces heavy yields of 4 ½” long by 1 ½” wide sweet paprika peppers. Peppers turn from green to red when mature. One of the finest quality strains for making Hungarian Paprika. Excellent color and ideal for grinding into Paprika powder. A variety from Hungary. Certified Organic.